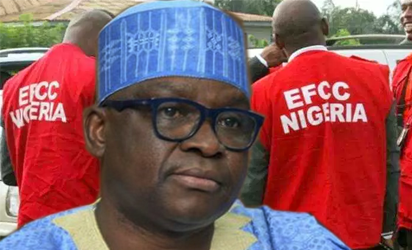 Lagos—Four prosecution witnesses, yesterday, testified before a Federal High Court sitting in Lagos, at the resumed trial of immediate past Governor of Ekiti State, Mr. Ayo Fayose, who is being prosecuted alongside a company Spotless Investment Ltd on an 11 counts charge of fraud, by Economic and Financial Crimes Commission EFCC. Fayose pleaded not guilty to the charge. Meanwhile, there was drama midway into the hearing between the trial judge, Justice Mojisola Olatoregun and EFCC counsel, Mr Rotimi Jacobs, SAN, when the judge raised concern over the failure of the prosecution to tender the complete three pages of the statement of one of the witnesses. Judge: “You are going beyond your bounds. Do not let me trash your practice. Listen to me, if you re-evaluate my rulings in this court, you”ll get into trouble. “You can only go on appeal, Mr Jacobs. Your mode of advocacy, I do not understand it, it looks like what do they call it? Jankara market. Earlier, three other witnesses, all Lebanese – Goshen Joseph; Joseph Mechleb and Maroun Mechleb, who are working in Nigeria as building and construction engineers, also gave their evidence. Mechleb, who is the Chief Executive Officer of a construction firm, Samchase Nigeria Limited, which is based in Akure, the Ondo State capital, while being led in evidence by the prosecuting counsel for the EFCC, Jacobs, told the court that he had done various jobs for both the Federal Government and some states, including Ekiti State. He said his brother once approached him to help get some jobs for JJ Technical Services Limited, because since the company was incorporated in 2007, it has never got a job. The Lebanese said at a time, Agbele approached him and asked if he had a company which could be used to get a contract.